Iditarod race officials announced Monday that four-time Iditarod champion Dallas Seavey was the musher whose dogs tested positive for a prohibited opioid painkiller in the 2017 race. The announcement follows two weeks of speculation after the race's governing board, the Iditarod Trail Committee Board of Directors, released a statement that "several" dogs on one 2017 Iditarod team tested positive for a "prohibited substance." It was the first time the Iditarod had publicly announced a positive result from a sled dog drug test. After race officials repeatedly refused to identify the musher whose dogs tested positive for the prohibited drug, tramadol, the Iditarod board issued a statement Monday afternoon saying it decided to name 30-year-old Seavey "because of the level of unhealthy speculation involved in this matter." The board's announcement followed a strongly-worded statement sent by Iditarod Official Finishers Club Monday morning, demanding race officials release the name of the musher whose dogs tested positive for tramadol within the next 72 hours. Seavey, a well-known Alaska musher from a well-known mushing family, sharply rebuked the way the Iditarod managed the drug test results in a 17-minute YouTube video posted online Monday after race officials released his name. Seavey said in an interview that he withdrew from the 2018 Iditarod in protest of race officials' "flawed" handling of the drug test issue. In his video, he said he never gave his dogs tramadol or "any banned substance." He said he had "never knowingly broken any race rule" and had "done absolutely nothing wrong." He said he wanted to tell the whole story about the drug tests and what happened afterward. "I don't care if I never race another dog race. I don't care if I never make another cent, which is my life, around this sport. I will not spend the rest of my life looking in the mirror knowing that I backed down when I did nothing wrong," he said. "The Iditarod can try to run me over. They can try to throw me under the bus. But I'm going to be honest to myself and they're going to find out I don't fit under the bus." The Iditarod's governing board has not penalized Seavey for the positive drug test. When the test results first became public two weeks ago, race officials said they likely couldn't penalize the musher, who was unnamed at the time. The 2017 race rules required that officials prove the musher gave the sled dogs a prohibited drug and it didn't get into their system in another way, whether given to them by another musher or laced in food. The Iditarod board revised the rules for the 2018 race, requiring mushers shoulder the burden of proof. If a sled dog tests positive for a prohibited drug, the musher now must prove he or she didn't give the dog the drug. Seavey said in his video Monday that he believes, most likely, someone gave tramadol to his dogs "maliciously." Chas St. George, Iditarod spokesman, said in an interview that race officials "can't rule anything out." Iditarod officials said in a statement earlier Monday, before naming Seavey, that a drug testing team collected urine samples from four of the unnamed musher's dogs in Nome, about six hours after the team completed the race. The statement said that before the race started, the musher had requested the team delay its collection from his or her team because he or she had already ordered additional tests and wanted to make sure the dogs "were sufficiently rested" for both. The request was approved and the samples were taken from the team on March 15, the Iditarod statement said. The day before, Seavey had won $59,637 for his second place finish. 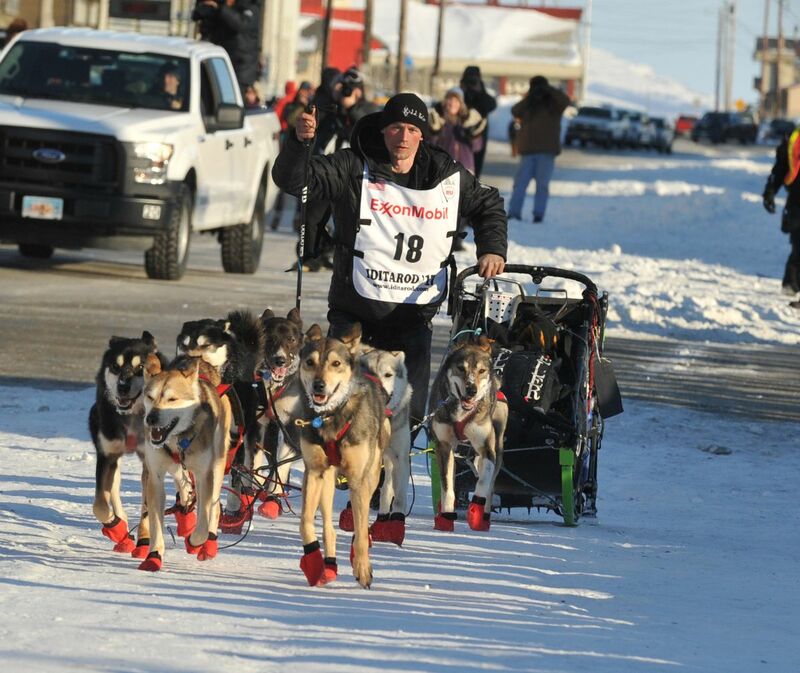 He crossed the finish line in Nome with seven dogs, two more than the minimum number of dogs required. He came in second to his father, Mitch, and arrived just five minutes before musher Nicolas Petit, who placed third. The Iditarod's statement outlines how the sealed samples from Seavey's team traveled from Nome to the testing lab, where they arrived March 17. At the lab, the samples were tested twice and the tests revealed that the samples contained tramadol, a drug the race prohibits, the statement said. It said the testing instrument was "Saturated/Overloaded," which Seavey also said in an anonymous statement he released last week under the guise of "Musher X." Iditarod race officials said last week that the test results revealed someone could have given the dogs tramadol anytime between right before the urine samples were taken to 15 hours earlier. Seavey questioned in his video why he would have given his dogs that much of a prohibited drug knowing they would have mandatory drug testing through Iditarod, plus participate in additional voluntary tests. He said he was out mushing sled dogs with his daughter, Annie, in April when he found out about the positive drug tests. He described it as "the worst phone call of my life." He said Mark Nordman, the Iditarod race marshal, called to report that Seavey's dogs tested positive for tramadol and asked if there was any way it was an accident. Seavey said he looked around his kennel and talked to "my people in Nome." He called Nordman back, he said. "I said, 'I know I am probably supposed to say that I accidentally gave this to my dogs in Nome but I have to tell you that there is less than a half percent of a chance that that happened,'" Seavey said in the video. He said race officials told him high levels of tramadol were found in his dogs' system and "someone would have to be completely ignorant" about the drug to not believe the dosage would yield a positive drug test. Race officials talked about adding security and he believed he was "cleared of all wrongdoing," Seavey said. He said he heard nothing more until the Iditarod board of directors released a statement two weeks ago, announcing it had revised its rules after dogs on a 2017 team tested positive for a "prohibited substance." In the Iditarod's statement earlier Monday, race officials denied they ever made a determination that it was unlikely the musher, unnamed at the time, gave the dogs tramadol. They said they never told the musher that the drug test issue was resolved and no further action was necessary. They said they did not lead the musher to believe an accident or foul play led to the failed drug tests. "As we are learning, that type of entertaining 'what ifs' can be destructive to individual mushers and the sport we all hold so dear," the statement said. The Iditarod Official Finishers Club, which bills itself as the "players union" for Iditarod mushers, said in its statement early Monday that it "vehemently denounces the doping of dogs in any form." "Furthermore, the IOFC does not support how the ITC has handled this issue," said the statement signed by 83 Iditarod mushers, some retired from the sport and others currently racing, including four-time Iditarod champion Jeff King, three-time runner-up Aliy Zirkle and Dallas Seavey's dad, Mitch, who won the 2017 race. Race officials approved the rule in 2015. It prohibits competitors from making public statements or engaging in public conduct that is considered "injurious to and in reckless disregard of the best interests of the race," including statements that are "disparaging" to any sponsors. Given the gag rule, Seavey said in his video, he expected his comments would leave him banned from the race. "I love the Iditarod," Seavey said. "The board is not the Iditarod."